Life is like a journey through a long hallway. The kind of corridor you would find in an old school or hospital. As you make your way past all the doors, all the events and opportunities in your life, the lights will sometimes flicker. Other times they will fade. And sometimes the lights that illuminate the hallway of life will go out completely, leaving you to stumble in the darkness. There are three things that can happen when you stumble in the dark. The first is that you wander forever, lost in the dark. Life, after all, is confusing and chaotic. When our reference point, our light, disappears we often just sort of bounce around from feeling to feeling and event to event. It is not ideal to be without guidance or direction, but there are worse fates than being lost. If the lights suddenly turned on and you could see stretching ahead of you nothing but pain and misfortune, you might long for more ignorant times. Would you rather be lost in the dark, not knowing where you’re going, or have complete vision and know you are going somewhere you certainly won’t like? This guys has no idea where he’s going. He seems pretty happy to me. Some people are more comfortable in the dark than others, like Batman. Even for those who absolutely hate uncertainty, being lost in the dark is still no reason to despair. Sometimes, if a person is really lucky or especially persistent, they can stumble around in the dark long enough to eventually find a way out. You never know when you might have an epiphany that completely changes your worldview. It has happened to me, it could happen to you. You never know when you might be presented with an opportunity that gives your life new purpose. Then again, purpose is not always welcome. Sometimes having purpose is really quite annoying. But purpose can’t exist in the dark. If you have a purpose, even one you don’t like, then you can never really be lost. In other words, when you are stumbling in the dark hallway, you never know when you might brush up against the light switch. 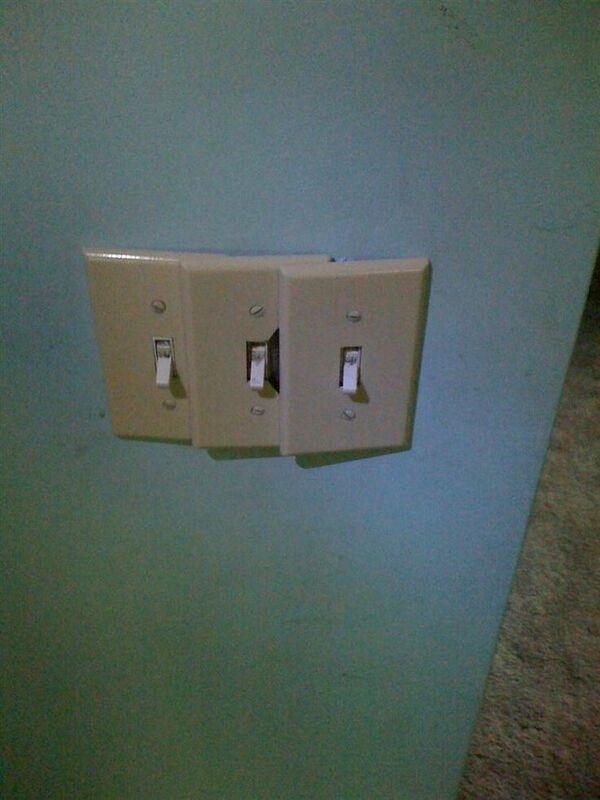 Light switches are installed in really weird places sometimes. None of these switches actually work. When stumbling in the dark people can wander forever, or they can eventually find a way out. There is one other thing that can happen when the hallway of life loses its illumination, and it is probably the most common. It happens to people who wander forever, just as it happens to those that find their way out. When you stumble in the metaphorical dark, chances are at some point you will stub your metaphorical toe. Are metaphors supposed to hurt this much? Life indeed is a journey. Well penned..